This slight configuration difference plays a big role in the structure of the molecules. The cis isomer is noticeably kinked while the trans isomer is straight, a similar structure to that of saturated fatty acids. (Photo Below: http://www.pleo.com/dupont/nomex/aramid07.gif) The trans isomer has a higher melting point because it can form a solid that is difficult to break apart because the straight structure allows it to pack more tightly than the kinked cis configuration. Partial hydrogenation is used commercially to make a fat that is solid at room temperature and melts when baked or eaten. But while the fatty acid becomes less prone to rancidity, it also increase risk of heart disease in the consumer. Trans fats do occur naturally in the milk and meat of cattle (they are produced by bacteria in the rumen), but the primary source of consumed trans fat is co mmercially produced through partial hydrogenation. Naturally, only 4% of the total fat in the meat and milk of cattle is trans fat. Commercially, however, as much as 45% of the total fat is trans fat; 30% of total fat in shortening is trans fat (“Trans fat”, 2008). Trans fats are often found in vegetable oils and are commonly used in fast food chains, restaurants, bakeries, and snack foods. The semi-solid consistency of the partially hydrogenated fat allows bakers to replace lard and butter and therefore to produce kosher food. Partially hydrogenated oil is also much less expensive than other semi-solid oils. The question then is: Does the reduced price outweigh the health risks? In the 2005 Dietary Reference, The National Academy of Science (NAS) claimed that “trans fatty acids are not essential and provide no known benefit to human health.” A separate study at the Harvard School of Public Health, came to a similar conclusion, “The consumption of trans fatty acids form partially hydrogenated oils provides no apparent nutritional benefit and has considerable potential for harm” (Mozaffarian, 2006). (Photo Above: http://www.abouttownguide.com/dutchess/articles/winter02/images/whats_wrong.jpg) The NAS further explained that “there is a positive linear trend between trans fatty acid intake and LDL cholesterol concentration, and therefore increased risk of CHD [Coronary Heart Disease].” More specifically, “any incremental increase in trans fatty acid intake increases CHD risk” (NAS, 2005). Trans fats contribute to an increased risk of CHD through their interaction with the lipase enzyme. The lipase enzyme is necessary for the absorption and digestion of lipids within the body because it functions to breakdown consumed lipids and allows for their absorption. The problem with trans fats, is that human lipase is specific to the cis configuration of fatty acids and is ineffective to trans fatty acids. Therefore, trans fatty acids cannot be broken down or absorbed and remain in the blood stream longer making the consumer more susceptible to arterial deposition and plaque formation, primary symptoms of CHD. 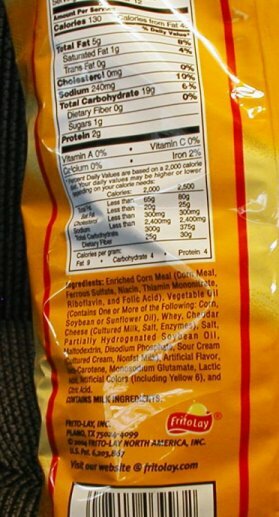 Many studies have proven that there is a strong connection between the consumption of trans fat and the risk of CHD. According to a study completed at the Harvard School for Public Health by Mozaffarian et al, “the consumption of trans fatty acids raises levels of low-density lipoprotein (LDL) cholesterol, reduces levels of high-density lipoprotein (HDL) Cholesterol and increases the ratio of total cholesterol to HDL cholesterol, a powerful predictor of [increased] risk of CHD” (Mozaffarian et. al, 2006). Also, Mozaffarian et al suspect that the systemic inflammation caused by trans fat intake could correspond to as high as a 30% increased risk of heart disease. More specifically, their research concluded that a “2% increase in energy intake from trans fatty acids was associated with a 23% increase in the incidence of CHD” (Mozaffarian, 2006). According to the Center for Science in the Public Interest (CSPI), 50,000 fatal heart attacks are caused by trans fat consumption each year (“Trans fat”, 2006). It is suspected that trans fat consumption could also lead to an increased risk of the following chronic diseases: Alzheimer’s Disease, Cancer, Diabetes, Obesity, Liver dysfunction, and infertility, but studies involving these diseases and the consumption of trans fats haven’t produced sufficient data to confirm these suspicions. Today 20% of the US is has banned trans fat. This is expected to increase as the publics knowledge of the health risks of trans fat consumption expands. (Photo at right: Trans Fat Bans in Restaurants, http://www.cspinet.org/transfat/index.html). National Academy of Science [NAS]. Dietary Reference Intakes for Energy, Carbohydrate, Fiber, Fat, Fatty Acids, Cholesterol, Protein, and Amino Acids (Macronutrients) Online Summary. The National Academies Press; 2005. 423- 424, 427-428. Mozaffarian, “Trans Fatty Acids and Cardiovascular Disease”, The New England Journal of Medicine. Vol 354 No. 15, April 2006. (1602-1613). hanks for your informative post.its helpful to understand it.